Everyone loves fried food, but most people don’t love how unhealthy it is. While French fries and donuts might be delicious, they are usually fried in tons of grease and hot oil that piles fat into your food and your body. If you want to start living a healthier lifestyle and reducing the amount of fat you consume in your regular diet, that doesn’t mean you have to give up your favorite fried foods forever. An air fryer might be your solution to your conflicting desires to be healthy and enjoy fried food. Air fryers fry food ranging from chicken to French fries to chips, but they don’t use any oil or grease. Instead, these fryers circulate hot air to fry your food to a crispy finish without any sogginess or mushiness. This method of frying cuts out grease and oil entirely, which significantly reduces the fat content of the fried food you eat and makes it much healthier to consume. 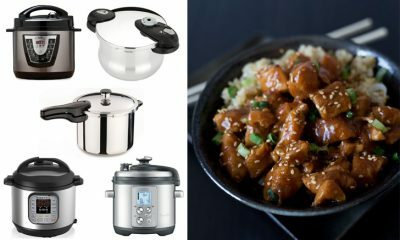 If you’re interested in frying food the healthy way, invest in one of these air fryers that represent the best air fryers the market has to offer. This air fryer circulates hot air at a high speed to evenly fry your food to crispy perfection. The smart preset button built into this air fryer is ultra-intuitive. It automatically memorizes the settings you use for your favorite food. Whenever you want to fry that food again, just press the preset button without having to re-customize the fryer’s settings. 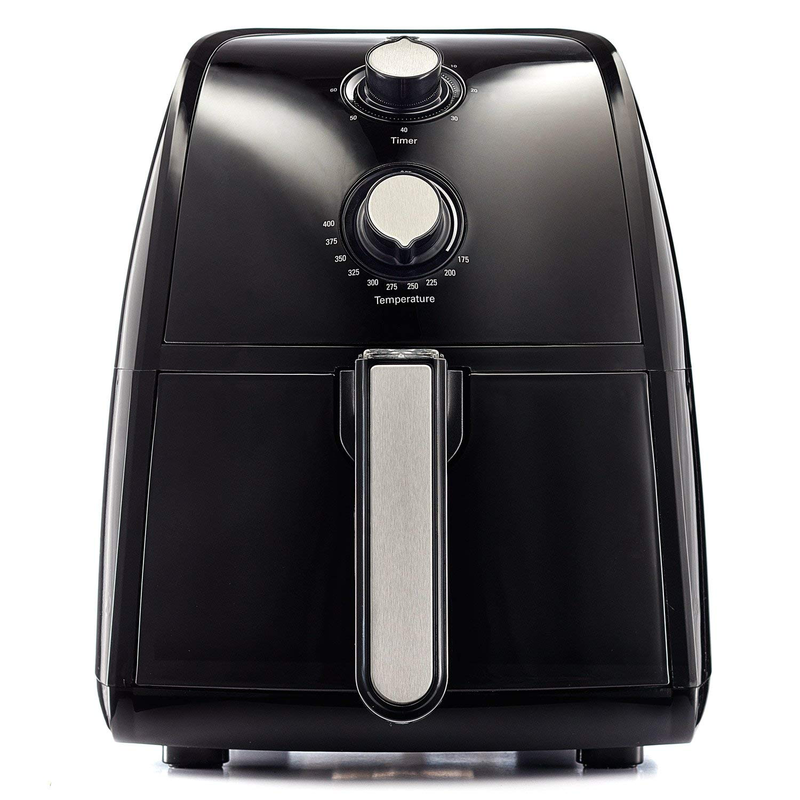 With a maximum capacity of 2.65 pounds, this air fryer can easily hold enough food at one time to feed four people. It is easy to control with its digital touchscreen that offers customizable settings. Plus, its drawer and food basket are both nonstick and dishwasher-safe for easy cleanup. Even if you’ve never fried food before, you can fry up delicious meats, fries, and more with this ultra-intuitive air fryer. This fryer includes seven built-in smart programs that are each designed to fry a different type of food to perfection. These different programs are designed for fries, chicken, steak, fish, shrimp, and more. The temperature options built into this air fryer range from 175 to 400 degrees F. If you want to fly solo without the help of one of the fryer’s smart programs, you can customize your frying using these temperature options. Controlling this fryer is easy with its built-in touchscreen. It also features a thirty-minute timer and shuts off automatically when its cooking cycle is over. If you’re at a loss for what to fry, you can explore all the frying possibilities this air fryer offers with its included recipe book. This recipe book includes instructions for successfully frying everything from chicken to veggies to cake to pizza and much more. One of the most notable features of this hot air fryer is its basket capacity. It has a four-liter capacity that holds up to sixteen cups of food at a time. 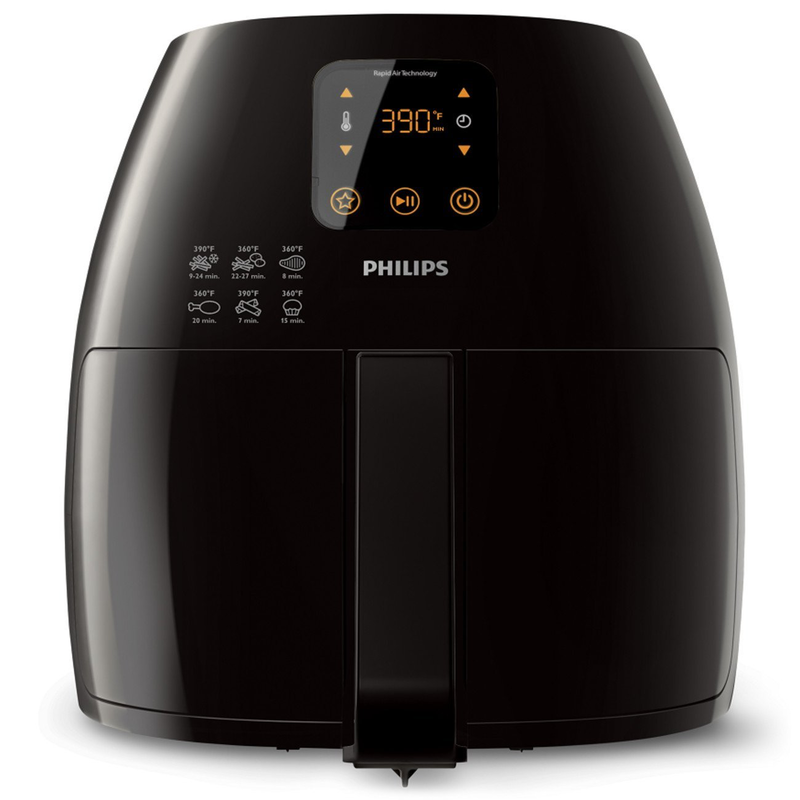 Its efficient hot air circulation system evenly fries large amounts of food simultaneously, leaving it crispy and juicy. When you use this fryer, you don’t have to worry about your food cooking for too long and getting overly crispy or soggy. It features a built-in, sixty-minute cooking timer that helps you keep track of how long your food has been frying. If you forget about your food, it won’t be ruined. This fryer has an auto-shut off feature for safety and convenience. Plus, once your food has finished frying, the fryer’s bright indicator light turns on to remind you that your food is fried and ready to eat. If you’ve never used an air fryer before and are looking for some inspiration, check out the recipe book that comes with it. 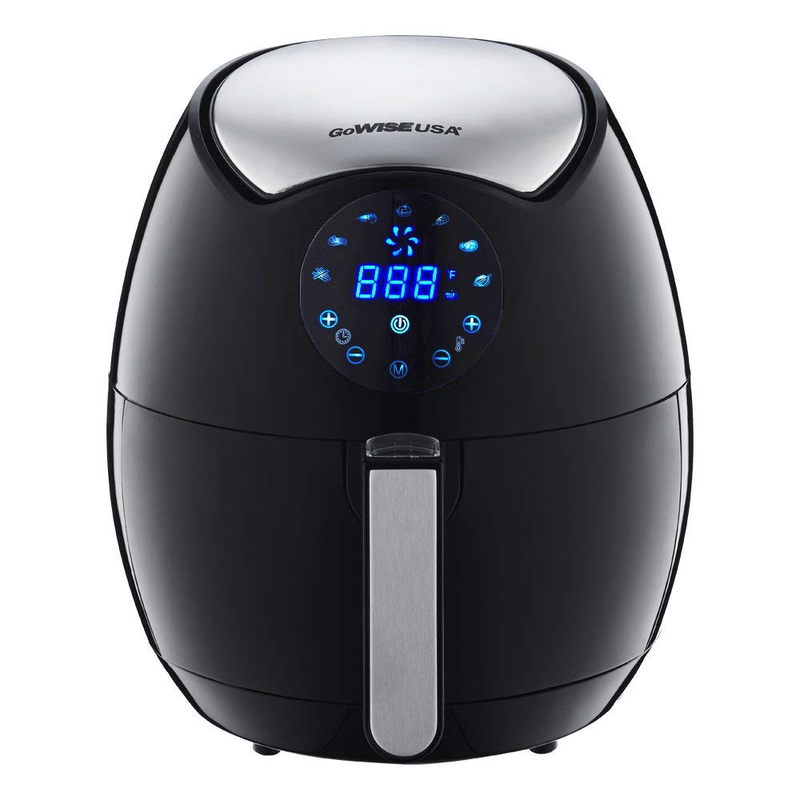 You can fry a full meal for two in this air fryer. It holds up to eight cups of food at a time, which equates to about two whole potatoes or up to eight standard-size chicken wings. 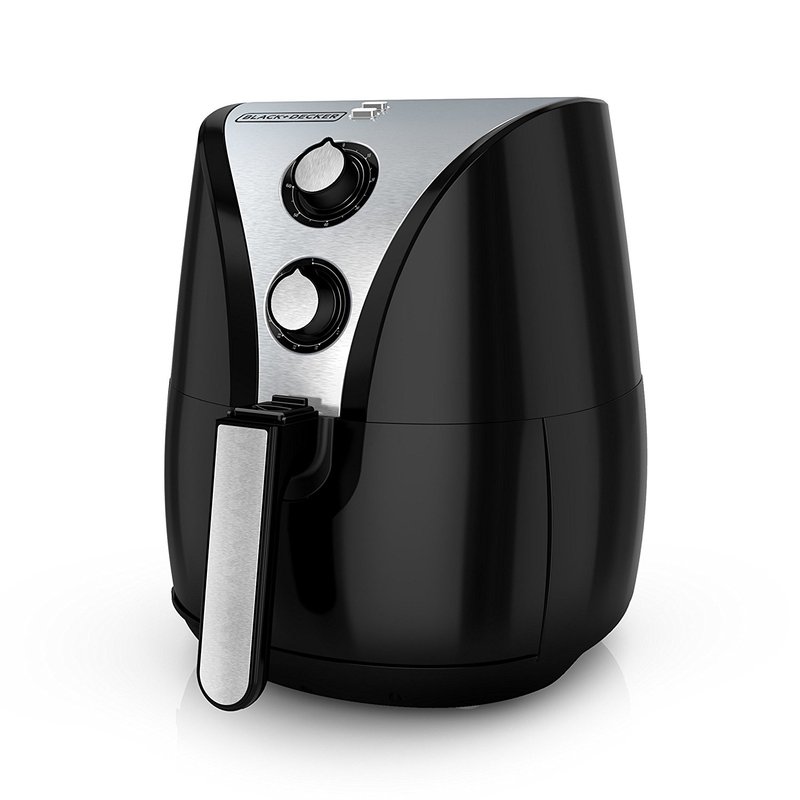 In fact, you could fry a meal of chicken wings and potato wedges simultaneously in this air fryer. Its built-in basket separator divides its cooking area in half, which allows you to fry multiple different types of food at the same time without worrying about them touching or their flavors mingling. This air fryer fries your food by circulating heat around its cooking space with its powerful convection dual fan system. After your food has finished frying, the fryer alerts you with its indicator light. Then, transferring the food to serve and cleaning up this fryer couldn’t be easier. Its pan, basket and separator are all made from nonstick material for smooth serving. Plus, its basket and separator are also dishwasher-safe for effortless cleanup. 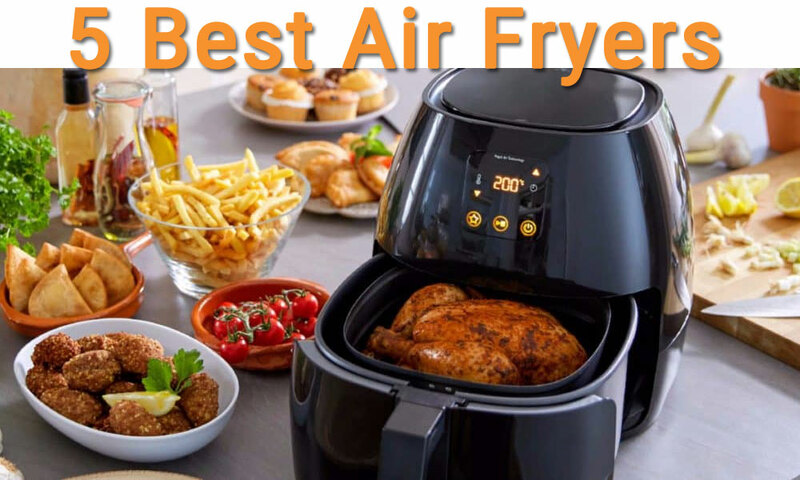 Built with a convection-type circulating heat system that delivers 1500 watts of heating power, this air fryer evenly fries your food in much less time than most other air fryers and traditional fryers. When its cooking cycle ends and your food is ready to eat, a bright indicator light on the front of the air fryer turns on to alert you immediately. You can fry virtually any food you want to perfection in this air fryer. It can hold plenty of food with its maximum capacity of 2.2 pounds. It also gives you plenty of temperature options that range from 175 to 400 degrees F to allow you to choose the optimal temperature for your food. These temperature options and the air fryer’s built-in indicator light ensure that your food always turns out crispy and never mushy or soggy. 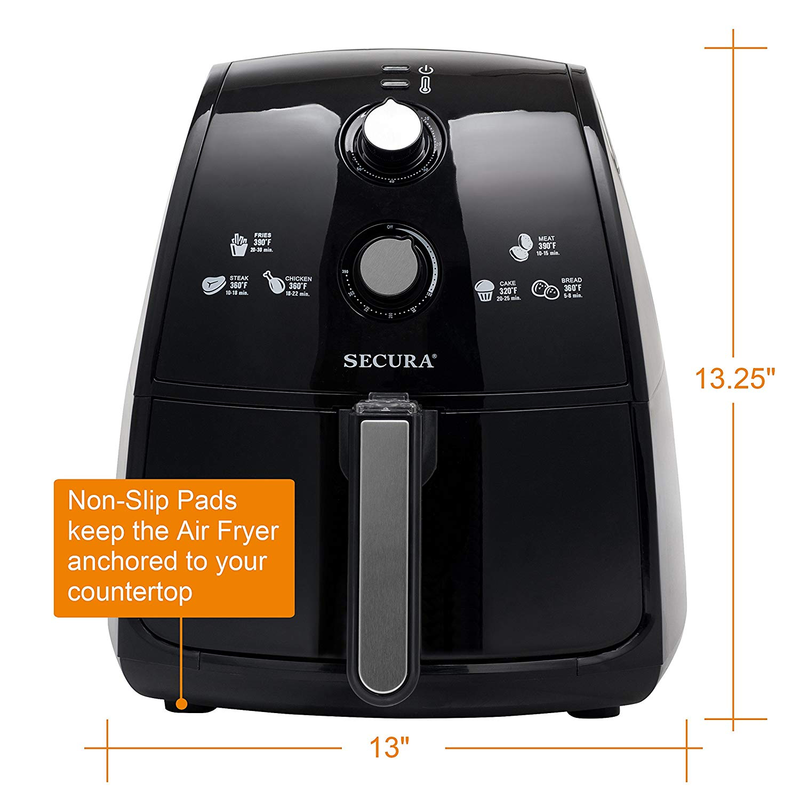 When you’re done using this air fryer, you don’t have to spend hours scrubbing it out to get it clean. Instead, just remove its baking tray and put it in the dishwasher. When you wash the rest of your dishes in your dishwasher, your air fryer will get clean and be ready for use again too.